Marina Sonkina Featured on the Cover of BC BookLook! Guernica author Marina Sonkina was recently featured on the cover of BC BookLook! In an article entitled “’Face’ mystery unveils ugly poperty values”, Marina Sonkina’s newest collection, Expulsion & Other Stories, is described as “nothing short of brilliant”. The article begins by explaining, “two thirds of Expulsion consists of Chekovian tales of survival set in the Soviet Union, but the longest and first story, ‘Face’, is a 65-page novella about Vancouver – and its apocalyptic ruin”. “Face” tells the story of an out-of-work actor named Matthew, who has been given an old bungalow next to the University Endowment Lands in Point Grey, Vancouver. In order to make ends meet, Matthew rents the basement suite to a mysterious woman named Erin, whose face is veiled. The article continues, “They have beguiling and often loopy conversations. Maybe she likes him. Erin never has visitors. He knows she has taken a job in a Thrift store. How does a guy get to know a girl when he can never see her face? He follows her. She enters a synagogue. Eventually his fascination with the bizarre lodger leads to a deeply disturbing revelation”. Sonkina’s collection includes many stories that are inspired by her experiences living in Stalinist Russia, but “Face” draws attention to Vancouver’s realty crisis. The article states, “several of Sonkina’s Soviet-era stories are more impressive and even more memorable, but the audaciousness of ‘Face’ and its completely unpredictable ending makes for a potent artistic response to the feeding frenzy of mini-Trump speculators who have made housing costs in tucked-away, provincial Vancouver on a par with Paris, Hong Kong and London”. 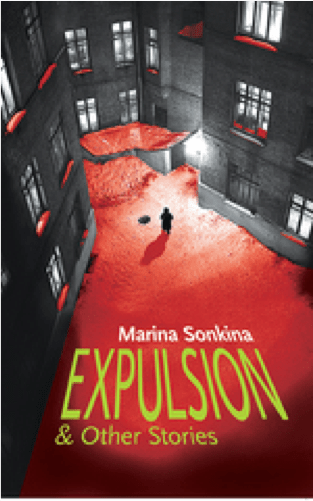 Tagged with BC BookLook, Expulsion & Other Stories, Marina Sonkina.